There have been a couple articles in the news lately about average salaries for various career-paths that I wanted to highlight. 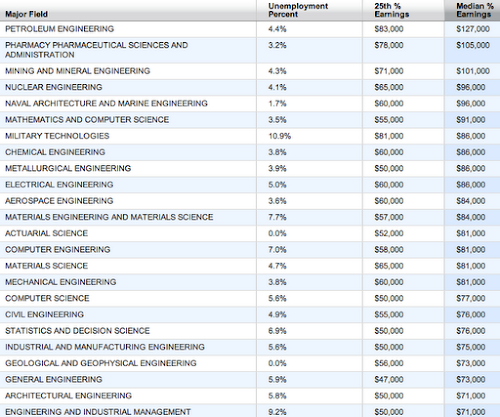 The first comes from the Chronicle of Higher Education and breaks down salaries by undergraduate degree. The second article is from the Wall Street Journal and not only shows the median salaries by career choice, but also the relevant unemployment rate. A lot 18 year olds would probably benefit from seeing something like this. Sure, doing what you love will make you happy, but perhaps you could learn to love petroleum.